For the fourth-straight time, the Miami Hurricanes played a game decided by three points or fewer, but also for the fourth consecutive time, they came out with a win. Freshman guard Chris Lykes, who continues to be the fuel that ignites Miami since the injury to Bruce Brown Jr., scored 15 points, dished out a game-high seven assists and made the game-winning free-throw to lead the Canes past the Virginia Tech Hokies 69-68 in their regular season finale March 3 at the Watsco Center. Miami hit 11 3-pointers and made 48 percent of its shots. DJ Vasiljevic scored a team-high 16 points and made four 3-pointers, and Lonnie Walker IV added 12 points. Virginia Tech came out on fire in the first half, hitting six 3-pointers and leading by as many as 12 points, but UM went on a 12-0 run early in the second half to take its first lead and shift the momentum. The Hokies fought right back to tie the game twice and take a 68-66 lead with 1:13 remaining in the contest. But the Canes kept their composure and closed the game out with a contested mid-range jumper by Lonnie Walker IV to tie it and then with the Lykes free-throw to win it with just three seconds left. With the victory, the Hurricanes (22-8, 11-7 ACC), who have won four-straight, move into sole possession of fifth place in the ACC standings and have a chance to move up to as high as third depending on the results of the Clemson and North Carolina games later Saturday afternoon. UM has already clinched a first-round bye and can secure a double-bye, which would require it finish in the top four of the conference, barring the results of those games. With the loss, the Hokies (21-10, 10-8 ACC) fall to seventh place in the conference but can move up or down in the rankings depending on the results of the North Carolina State and the Louisville games. Guard Justin Robinson, one of five Virginia Tech players that average double-figure scoring, had 18 points to lead the Hokies. The ACC Tournament starts Tuesday, March 6, at the Barclays Center in Brooklyn, New York. Miami’s opponent and the date of its first game is to be decided. Since the injury to Bruce Brown Jr. 10 games ago, Lykes has been Miami’s leading scorer, putting up 13.8 points per game. For the third-straight time, the game came down to the final shot for the Hurricanes. Miami and Virginia Tech came into the game tied for fifth place in the ACC standings, along with N.C. State. 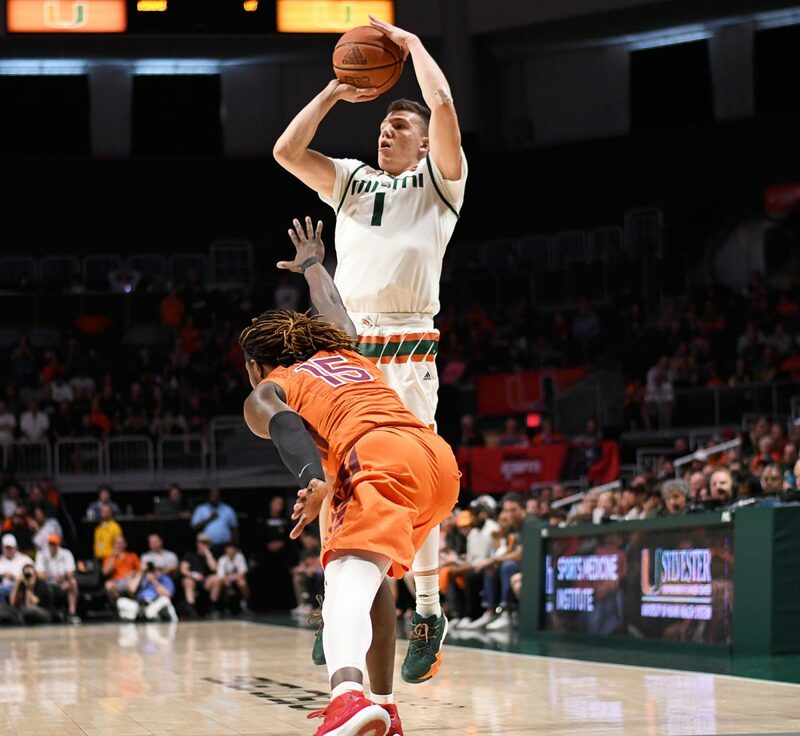 Both teams were coming off close wins against ranked opponents – the Canes made a 3-point buzzer beater to beat the No. 9 Tar Heels by three, and the Hokies made a game-winning put-back layup to defeat the No. 5 Duke Blue Devils by one point. Along with a victory against Duke, V-Tech, which led 39-32 at halftime against Miami, has wins against Virginia – the only ACC team to beat the Cavaliers – UNC and Clemson on its resume.